The distinct smell of crackers clings to the night air as we drive in. ‘Welcome to Pyro Town’, proclaims a wayside board. 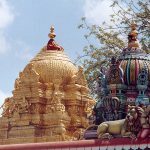 We are in gandhaka bhoomi or the sulphurous land of Sivakasi, which accounts for 90% of India’s total fireworks production, 80% of all safety matches and 60% of total offset printing solutions. In a roadside shop, the list of luminaries on the fireworks boxes is mind-boggling. In remote Sivakasi, blissfully unaware of copyright infringements, everyone from Asin, Britney Spears, Marilyn Monroe, Harry Potter, Superman, Spiderman and WWF wrestlers hawk the wares. Baby bump or not, Aishwarya Rai was still the universal favourite. In the lobby of Bell Hotels, the only decent hotel in town, we bump into Mr. ASP Arumugaselvan of Kaliswari Fireworks, who gives us a brief overview on how this nondescript town became a booming centre for fireworks. Earlier, Calcutta was the main hub as chemicals and metals unloaded at its port from European countries encouraged a small-scale industry of Bengal lights and fireworks for festive and religious occasions. The first tubris (flowerpots) were fashioned out of mud and inter-street tubri competitions are held in Bengal even today! But production of fireworks was restricted by the British due to fear of anarchist activities. In early 20th century, Mr. Dasgupta started a match factory in Calcutta with small, semi-automatic machines imported from Japan to develop coloured matches, crackers and fountains. 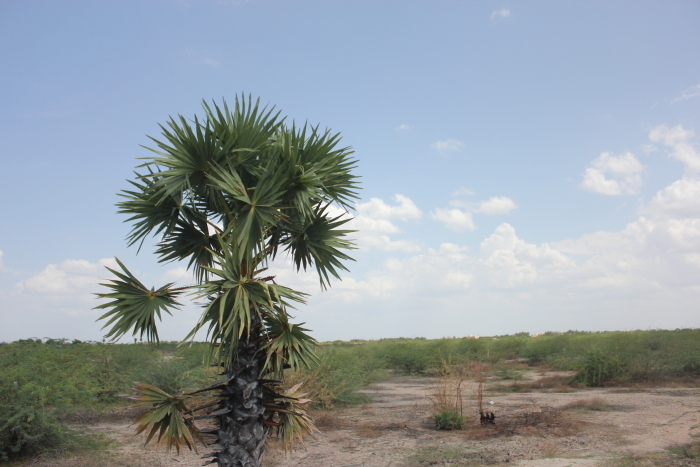 Around the same time, Sivakasi was reeling under drought and famine, forcing two enterprising cousins, A Shanmuga Nadar and P Ayya Nadar, to head for Calcutta in search of better prospects. There, they stumbled upon the Japanese match factory next to their lodge. After learning the craft for eight months, they returned to Sivakasi and established a factory with raw material and machines imported from Germany. When mechanized production proved costly, they adopted Gandhiji’s swadeshi mantra and call for cottage industries. The brothers switched to manual production using cheap local labour and set up individual factories in 1926 – Kaka Match Industries and Anil Match Factory, with crow and squirrel as their symbols. In those days, plain phosphorus sticks were used to strike a light and Swedish Match had just established WIMCO (Western India Match Company). Through experiments and books on chemistry, the brothers developed safety matches and colour matches, which were being imported from Europe and Asia. In due course, other entrepreneurs applied match-making techniques to produce fireworks, thereby triggering the birth of a second industry. Since labels were sourced from Mumbai and Chennai, KSA Arunagiri Nadar established a litho-printing unit in Sivakasi in the 30s. The introduction of offset was the genesis of a third industry. Sivakasi had a clear advantage over other places. Its all-year-round dry and sunny weather made it ideal for these industries to flourish. Damp weather and moisture not only affected the crucial drying process of fireworks, but also crinkled the paper, making it difficult for printing. 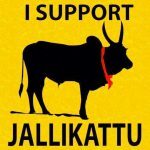 Today Sivakasi has a matches, firework or printing unit in every nook and corner, thus earning the sobriquet Kutty (Little) Japan. Little do people know that Sivakasi also provides customized solutions like practice bombs, smoke screens, powders and fuses to the Indian Army and its Ammunition and Ordnance factories. The local fireworks industry is estimated to be Rs.2,000-3,000 crore. 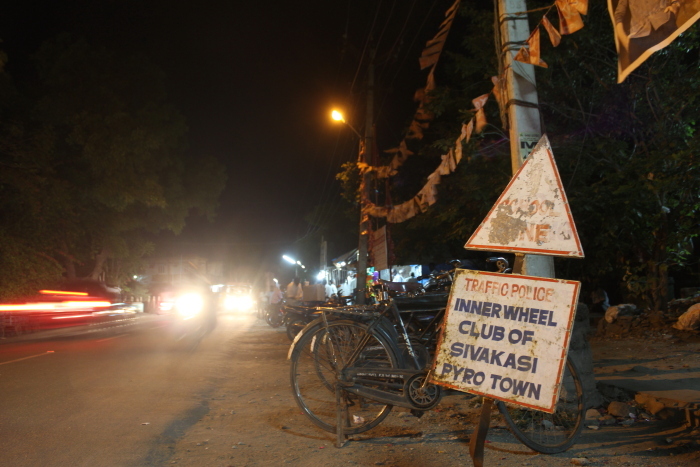 But it was a chain of unconnected events that led to Sivakasi’s rise as India’s fireworks capital. When a Central Excise Duty was levied on matches in 1934, people diverted their energies towards fireworks. 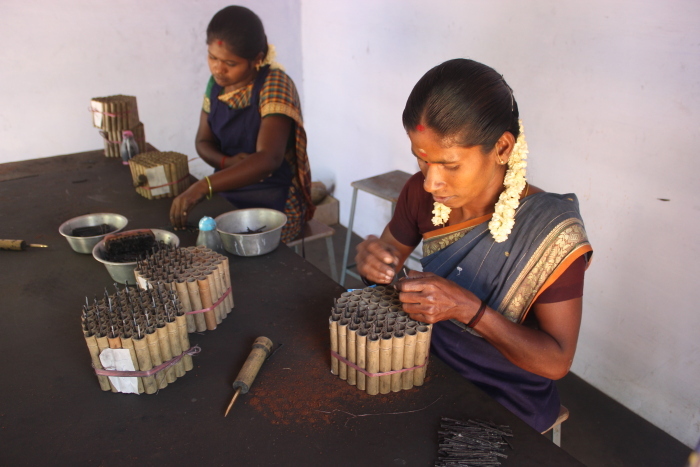 Until the outbreak of World War II in 1939, there were only a few units in Sivakasi, but the obstruction of firework imports during wartime boosted the indigenous industry. In 1940, the Indian Explosives Rule introduced a new system of licensing for the manufacture, possession and sale of fireworks, paving the way for the first organized factory. By 1942, other companies like National, Kaliswari and Standard Fireworks set up shop. With the end of World War II in 1944, the renewed import of raw materials helped expand the market. People who worked under the two Nadar brothers – be it a typist, worker or accountant – eventually set up their own units with their blessings. On the challenges and problems faced by the industry, Mr. Arumugaselvan laments, ‘Sadly we don’t have a hub. Restrictions on transportation and explosive rules on shipping and aircrafts have hampered the industry’s growth overseas. There’s no electricity supply in manufacturing units out of fear of a short circuit. Despite 99% literacy in Viruddhnagar, unlicensed set-ups employ uneducated people and their carelessness leads to mishaps. Licenses for up to 12 sheds are granted from Madras, but for more than 12 sheds, one has to go to the central office at Nagpur. Officers from the Explosives Department and Factory Act people come for regular checks. 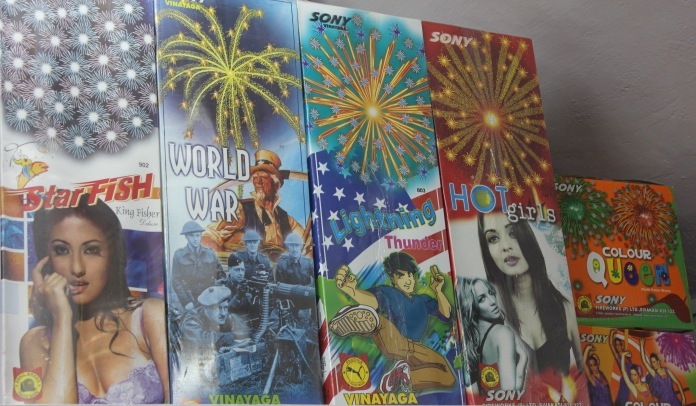 ‘Today, Sony Fireworks has a turnover of Rs.70-80 crore and is Number 1 in Sky Outs. Our Rainbow Smoke and Confetti explosions are used in films and Bollywood shows. Each year, new products and designs are introduced based on latest trends. Our young MDs, Mr. Karvanan and Mr. Ganeshan, with strong chemistry and marketing backgrounds, have brought in fresh thinking and new technologies. After KBC caught on, we introduced ‘Magic Show’, with fake Rs.500 and Rs.1000 notes bursting with each explosion. Now that’s called literally blowing up money’, Ganeshan chuckles. Firework factories are divided into specialized units that manufacture Paper Caps, Ring Caps, Serpent Eggs, Bombs, Rockets, Sparklers or Fancy Items. The compound wall is usually 100 m away for reasons of safety. Due to lack of space inside town, explosives factories have spread across a 20 km radius around Sivakasi – Tiruthangal, Servaikaranbatti, Kumaralingapuram, Vellur, Kavalur, Ammathur, GN Petti, etc. The only company located inside town is Bharat Fireworks started in 1923. But we are off on a factory visit to Standard Fireworks, India’s largest fireworks company, with 47 factories, a fleet of 200 buses, a massive godown, offset printing units and a Mega Store. Today, this single unit employs 340 people, of which 280 are women. Women make roughly Rs.100 a day, while men get Rs.150 because of heavier workload. Chemical mixers, who work lesser hours, also make Rs.150 as it’s a high-risk, specialized job. Four buses ply daily and work starts at 8 am. 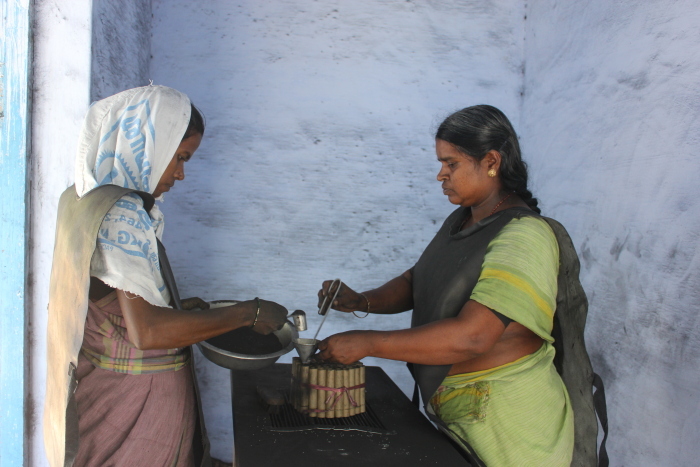 In a mixing shed behind mounted walls, a stipulated amount of masala is prepared, enough to be used in a day, otherwise the chemical decomposes and becomes unstable. With 55 sheds, each having four workers, this unit churns out 26 varieties including sparklers, flowerpots and fancy items. The unit works at a brisk pace to meet its daily target of 250 assorted boxes. Each firework is unique with its own chemical formula and shell. As per safety guidelines, not more than 25 kg of explosive masala can be prepared at a time. At a drying platform, masala is dried on 3 mm thick rubber mats till noon everyday; doing it directly on the ground poses a danger of explosion. Only brass implements are used as iron may cause combustion. Each worker handling gunpowder and firework mix wears a rubber apron and headscarf for protection. All must customarily wear cotton. Peppered through the premises are sand buckets, water troughs and first aid boxes. Safety showers are installed in case of fire accidents, besides a siren and a wind balloon to indicate the direction of wind. While fire engines are stationed 5 km away, a water tanker is on standby for dousing larger flames. 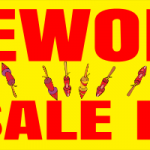 At the sparkler section, ladies deftly stack and tighten 10½ inch long copper-coated wires in a 17X18 wooden grid. 600 such frames are churned out each day. 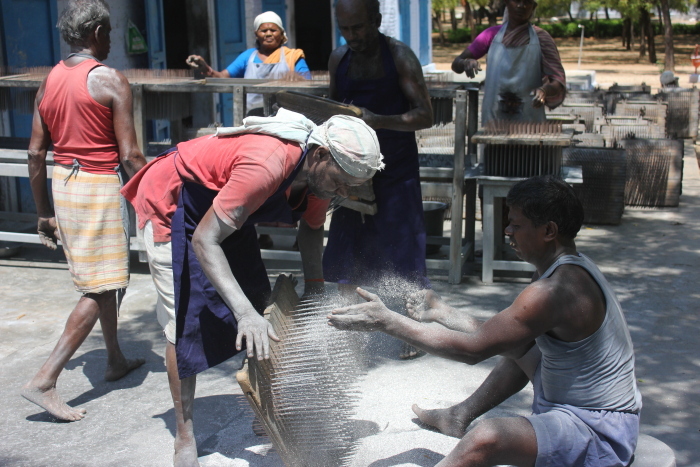 A human chain passes the frames to and fro as they are dipped into a grey chemical paste, before being sun-dried for an hour, until the next two coats are applied. Some frames are taken to a man seated with a pile of shiny powder who flings magnesium alloy to create the crackling variety. At 2 pm, the sparklers are picked out of the frames and women swiftly pack them into sets of 10, which are further bundled into sets of five. 40 such bundles are put into cardboard cartons, punch-stapled and loaded onto bullock carts for transportation. 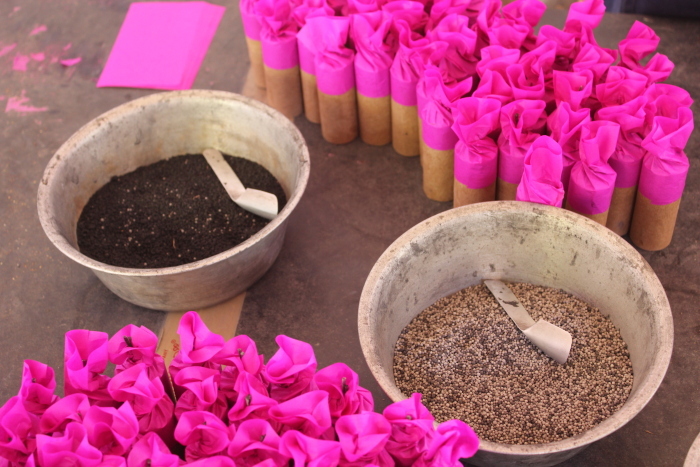 In the flowerpot section, women busy churn out ‘Happiness’, a pink-wrapped cylinder that creates a whistling sound. The chemical mixture is spooned into the outer tube – black gunpowder at the bottom to provide lift and colour pellets on top for show. The inner whistling tube is filled with whistling chemical and a wick, and the tube is packed with sawdust. Both ‘Happiness’ and ‘Splendour’, a violet-coloured tube that produces a crackling sound, are manufactured with Chinese technical collaboration. In the Tower Pot section, large pyramidal flowerpots are being pierced with a brass needle as another worker fixes the wick with black chemical goo. On an outdoor table, a lady pours fasting solution into a bowl of dry powder and gently stirs it as if preparing batter for a brownie. In another shed, ladies pack Mini Fountains in plastic packets like assorted candies. Elsewhere, the deodorant-sized Jade Flower is being packed into cartons of five and three 18” long cylinders are twirled together to create a Magic Tree. A lady supervisor oversees the operations of five sheds and 15 watchmen guard the facility at night. At 12:30 pm, the gong is struck, announcing lunch. Women slowly pour out of their sheds and unhurriedly clean their hands with industrial soap and coconut oil. With foreman S Kannan in tow, Mr. Mummurthy cajoles the workers as he leads us to the office for tea and biscuits. ‘You have to be strict, yet keep them in good humour. Not only must we look after employees, we also decide on the mix and what has to be made everyday. The chemicals used are more or less the same – Potassium Chlorate, Sodium Nitrate, Barium Nitrate, Strontium Nitrate, Sulphur, PVC Resin, Charcoal, Metal powder and Aluminum powder. But every company has its trade secrets and only years of experience leads to unique mixes. All our raw material comes from sister concerns like MEPCO (Metal Powder Company) at Tiruthangal. Authors: Anurag Mallick & Priya Ganapathy. This article appeared as a Diwali special feature in the November, 2011 issue of Rail Bandhu, the Indian Railways’ in-train magazine.